Key Difference: The Paleo Diet and Mediterranean Diet are two different types of diets that have gotten very popular these days. 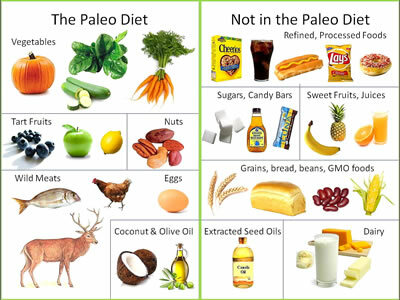 The Paleo Diet stands for Paleolithic diet. It touts the benefits of the diet that was followed by the pre-historic man. The Mediterranean Diet follows a combination of the dietary patterns of the areas around the Mediterranean Sea, especially Greece, Southern Italy, and Spain. Since the industrial revolution, there has been a slow but steady increase in the sedentary lifestyle. Before, people were more likely to work in the fields or walk for hours to the market. Now, due to technical advantages nobody has to do any of that stuff, instead we earn our living by sitting in a chair in front of a screen all day. While, the industrial age and the technical age did bring about many improvements, it did have a negative impact on our fitness. The lack of fitness activity has led to an increase in obesity. In fact, more than half the population in some developed counties is overweight. As people have become more conscious about their health and weight, they have started to turn to diets in order to maintain their weight. The Paleo Diet and Mediterranean Diet are two different types of diets that have gotten very popular these days. Many people have criticized these diets as fads, which means that they restrict food intake of certain kinds which results in unbalanced nutritional intake. Fad diets usually lead to short term weight loss, and have no concern for long-term weight maintenance. Fad diets usually become very popular for a short amount of time and then decline in popularity. The Paleo Diet stands for Paleolithic diet. It touts the benefits of the diet that was followed by the pre-historic man. It asks its supporters to follow the diet of the humans during the Paleolithic era. The diet claims that man developed nutritional needs specific to the foods that were available at that time. The Paleolithic era was a period lasting around 2.5 million years that ended about 10,000 years ago. During the era, there was no agriculture or domestication of animals; hence the diet claims that humans should avoid grains, legumes and diary. According to the diet, human metabolism has been unable to adapt fast enough to handle many of the foods that have become available since the start of agriculture. Hence, the human diet remains best adapted to the diet of their Paleolithic ancestors. These new foods have led to modern-day problems such as obesity, heart disease, and diabetes. The diet’s proponents claim that the Paleolithic diet may lead to a longer, healthier, more active life. The Paleo Diet is also known as the caveman diet, Stone Age diet and hunter-gatherer diet. 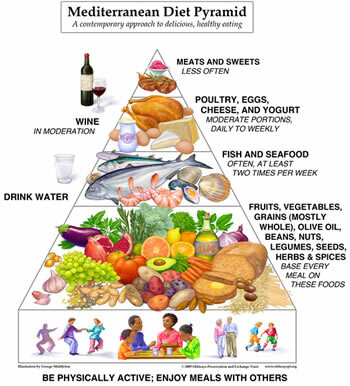 The Mediterranean Diet is another diet that has gotten popular in recent times. It follows a combination of the dietary patterns of the areas around the Mediterranean Sea, especially Greece, Southern Italy, and Spain. The reason behind this diet is that people in the Mediterranean have been found to have far lower rates of cardiovascular disease than in western countries. This is despite the fact that they have similar levels of fat consumption. One of the main explanations for this is thought to be the health effects of olive oil, which is heavily consumed in the Mediterranean region. The diet claims that the person should primarily consume olive oil, legumes, unrefined cereals, fruits, and vegetables. They should also consume moderate to high amounts of fish, dairy products, especially cheese and yogurt, as well as red wine. The diet that was followed by the pre-historic man in the Paleolithic era before the advent of agriculture and domestication of animals. The dietary patterns of Greece, Southern Italy, and Spain. Meat, fowl, seafood, vegetables, fruits, nuts, and seeds, etc. All that a hunter-gatherer would come across. High consumption of olive oil, legumes, unrefined cereals, fruits, and vegetables, moderate to high consumption of fish, moderate consumption of dairy products (mostly as cheese and yogurt), moderate wine consumption, and low consumption of meat and meat products. Grain, legumes, dairy, high-calorie processed foods, processed oils, refined sugar, salt, alcohol, coffee, etc. Reduce the risk of a premature death and increase the chance of a healthy retirement, free from long-term medication. Can reduce the chance of developing conditions such as heart disease, type 2 diabetes, high blood pressure, obesity and even Alzheimer's disease.